TSTMRKT is a performance art piece that incorporates time, minimalism, absurd theater, film collage, and a pre-recorded soundtrack. The “set” is constructed through sound, and the sound is pre-recorded in “real time.” This recording is played back during the live performance. Everything is automated except the actors, so it is crucial that they know the work verbatim as well as the timing and delivery of each line, in order to match what is happening in the panorama of sound. A syllable of error mean that the entire performance can fall apart. The content is humorous, dark, and furiously absurd. 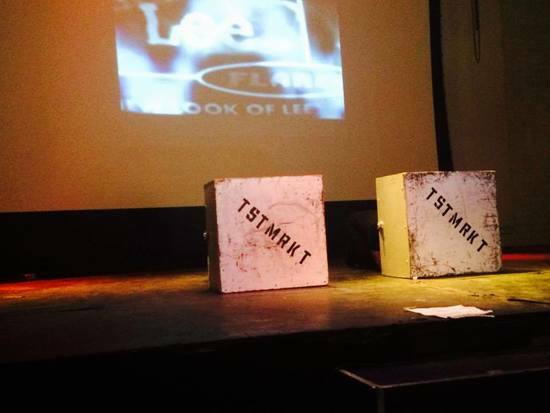 TSTMRKT will push the boundaries of artistic integrity and the buttons of the audience, all in a single, 60 minute, content-heavy performance.